Kingston ON … The Isabel Bader Centre for the Performing Arts at Queen’s University launches its 5th Anniversary Season that includes the inaugural The Ka’tarohkwi Festival of Indigenous Arts (pronounced Cat-ar-oh-qui). The festival’s signature events include the National Arts Centre Orchestra’s performance of their commission, I Lost My Talk inspired by the poem by Rita Joe and Qiksaaktuq with and by throat singer and vocalist Tanya Tagaq and Christine Duncan. 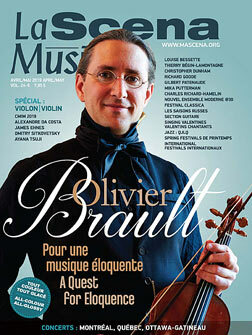 This anniversary season includes Canadian and international established artists such as the Danish String Quartet, pianist Stephen Hough, I Musici, Tafelmusik Baroque Orchestra, the jazz funk group Shuffle Demons, the Queen of Klezmer Alicia Svigals, Rachel Podger, and recent Juno Award winners Jan Lisiecki and James Ehnes. This season features emerging top talent including the Isabel debut of recent international competition winners, Seong-Jin Cho, Narek Hakhnazaryan, Nareh Arghamanyan, Juilliard415, and the recent winner of the Isabel Overton Bader Canadian Violin Competition, Yolanda Bruno (to be recorded for national broadcast by CBC Radio 2). With a focus on celebrating Kingston, the new Kingston Connection series includes such artists as The Abrams, Kelli Trottier, and Miss Emily (Emily Fennell), and the Kingston Children’s Corner includes Blue Canoe Productions and Triola. The Isabel partners with Kingston’s PeaceQuest in The World Remembers with Andy Rush and the Open Voices Community Choir, and Okavango African Orchestra. The Isabel plays a leadership role as a centre of artistic creation. This year Indigenous Festival curator Dylan Robinson is the curator for a number of Indigenous creations. 2018/19 WORLD PREMIERESinclude: Wani’/Lost by Lisa Cooke Ravensbergen, a new collaborative work by Peter Morin, Jeremy Dutcher, and Bracken Hanuse Corlett, a new work by Tanya Lukin Linklater for violin and dancers, and Celebration by Michel Szczesniak. Other innovative projects include Eve Egoyan’s innovative EarWitness project in collaboration with the Tone Deaf Festival (Kingston’s annual festival of adventurous sound performance), Tafelmusik’s multi-media Bach and his World project, and a collaboration with Michael Wheeler, co-creator and artistic director of SpiderWebShow, in foldA (Festival of Live Digital Art) where SWS will engage with creators across the country. “Our 5th Anniversary season features amazing artists and creators at the Isabel, with a focus on local, Canadian, and international artists. What a privilege it is to work with Dylan Robinson in his role as the Curator of the inaugural Ka’tarohkwi Festival of Indigenous Arts. With socially engaged art, the artists are cultural agents of change who transform the societal agenda, as the arts are powerful tools of persuasion. With this Indigenous arts festival, tremendously talented leading artists’ imaginations will soar. This distinctive public forum for cultural creativity helps to halt the historic erasure of Indigenous culture as well as de-escalate the colonization of thought. We thank the Joseph S. Stauffer Foundation for their generous patronage of this anniversary season, and Isabel and Alfred Bader Fund, A Bader Philanthropy for their inspiring support of the Indigenous Festival,” says Isabel Director, Tricia Baldwin. Imagination takes flight as Canada’s leading and diverse Indigenous artists bring outstanding and original cultural experiences inspired and shaped by the wisdom of hundreds of generations. Student and community audiences will embark on a greater quest for a deeper knowledge of Canada’s Indigenous cultures through a spectacular array of music, dance, theatre, and film, and engage in thought-provoking conversations that will arise as a result of increased cultural understanding. The Festival is supporting creation-based residencies and the mentorship of emerging Indigenous creators by senior Indigenous artists. “We are excited to share with you a diverse array of performances by acclaimed Indigenous artists working across theatre, dance, music, film and performance art,” says Ka’tarohkwi Festival of Indigenous Arts Curator and Queen’s Canada Research Chair of Indigenous Arts, Dylan Robinson. “The Ka’tarohkwi Festival of Indigenous Arts (pronounced Cat-ar-oh-qui) is situated on the traditional territory of the Anishinaabeg and Haudenosaunee peoples. Our inaugural festival takes its name from the Huron and Mohawk word for the lands we gather on: Ka’tarohkwi. The festival runs in tandem with the Soundingsexhibition at the Agnes Etherington Art Centre, and two exhibitions by leading Indigenous artists at Modern Fuel Artist Run Centre. We invite you to join us for these performances, exhibitions, and gatherings. We thank the creative team of I Lost My Talk: the National Arts Centre Orchestra for commissioning and producing I Lost My Talk as part of their Life Reflected project. We thank Mi’kmaw elder and poet Rita Joe, C.M., composer John Estacio, choreographer Santee Smith Tekaronhiahkhwa and the dancers of Kaha:wi Dance Theatre, narrator Guna and Rappahannock actor Monique Mojica, filmmaker Barbara Sweete, visual designers Normal, and the whole creative team behind Life Reflected at the National Arts Centre. Qiksaaktuq was originally commissioned by the Toronto Symphony Orchestra with financial support from the Government of Canada for performance in March 2017. We thank the original creative team of creators Tanya Tagaq and Christine Duncan, with Jean Martin, Christopher Mayo, and the Toronto Symphony Orchestra. Festival films will be announced in the fall of 2018. Soundstreams Canada with their Seven Deadly Sins project with a naughty but nice spectrum of classical, jazz, and Judeo-Spanish styles, genres, and cultures. Includes new works and performances by Elizabeth Shepherd, Aviva Chernick, Robin Dann, Christopher Mayo, and Analia Llugdar, and more. Tafelmusik Baroque Orchestra’s multimedia Bach and His World, created by Alison Mackay. Celebration! with Yolanda Bruno, winner of the Isabel Overton Bader Canadian Violin Competition, includes world premiere of Michel Szczesniak’s Celebration. Tribute to Herb Alpert with Ron Di Lauro, Marc Bolduc and their band. The Isabel is grateful for the support of its 5th Anniversary Season Benefactor, the Joseph S. Stauffer Foundation, and the Ka’tarohkwi Festival of Indigenous Arts benefactor, Isabel & Alfred Bader Fund, A Bader Philanthropy, Kingston Connection Series supporter, the J.P. Bickell Foundation, Media Sponsor The Kingston Whig-Standard, Hotel Sponsor Delta Hotels Marriott, Kingston Waterfront, and many donors, all of whom make our world turn at the Isabel.